Just about every device we anticipate seeing at Google's October 4 event has leaked today, and the Google Home Mini is no exception. 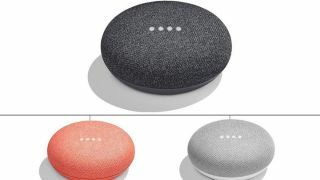 As the official name suggests, the Google Home Mini is a shrunk down version of the Google Home. Think of it like the Amazon Echo Dot to the Amazon Echo. Today's leaked images and details, courtesy of Droid Life, reveal a smart speaker in the shape of a rounded off hockey puck. The colors it'll come in are nearly identical to those of another leaked device, the new Google Daydream View. It appears you'll be able to choose a Google Home Mini in either Chalk (grayish white), Charcoal (dark gray) or Coral (a peachy pink hue). Unlike Google Home, the opaque bases that match the top speaker portion reportedly won't be interchangeable. Like the standard Google Home, the Mini appears to plug in, based on the cord in the leaks. Many of the same functions, such as using Google Assistant, setting reminders and reading the news, also apply. Google Home costs $129 (£129 / about AU$170), and here's where the Google Home Mini differs greatly. It will reportedly be priced at $49 (about £40 / AU$60), same as the Amazon Echo Dot in the US. Putting out a cheaper, smaller speaker is a natural move for Google, especially if it hopes to compete with Amazon. The Amazon Echo Dot is Amazon's top seller in its Home Audio Speaker category, and it's rumored to be releasing an Amazon Echo 2 later this year. Expanding lines to offer customers more choice at different price points - and to stay up to speed with competitors - is a move we see regularly by tech companies, and Google looks to be no exception. Also look for the Google Pixel 2 and Pixel 2 XL to be unveiled on October 4, along with the new Google Daydream View and Pixelbook 2-in-1 laptop. Have you seen the latest Google Home deals and prices? Or maybe you'd like a cheap Amazon Echo Dot?